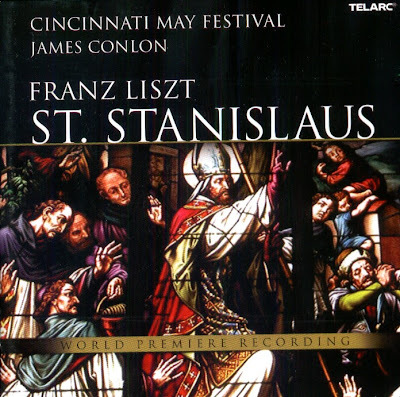 This is the first complete recording of the two scenes Liszt finished for his last great project: an oratorio on the matyrdom in 1079 of Poland's patron saint. It was, Liszt said, his "Nunc dimittis", by which he meant a hymn for the close of day, a valedictory prayer, like the Canticle of Simeon. He composed the music scene I in 1874. He returned to the music in 1882, after an eight-year hiatus during which various poets helped him improve the libretto. Liszt sent the finished score of Scene IV to his publisher just weeks before he died in 1886. No music exists for scenes II and III. In this recording scenes I and IV are performed just as he left them, with one exception: at the end of scene I, the bishop's mother's area, which Liszt left in piano-vocal score, has been orchestrated in a manner consistent with his other orchestral works from the 1870s. The CD was released by Telarc, 2004 (DDD). Telarc CD-80607.